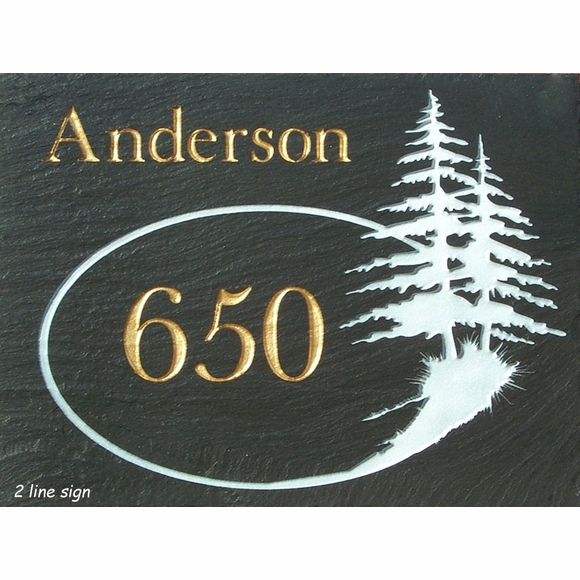 Personalized Slate Address Sign with Evergreen Tree - - with either two or three lines of personalization. Made in USA. Two-line personalized address sign is designed for a name at the top and house number in the center. Line 2 holds up to five (5) characters. Black with gold printing and white tree accent. Three-line sign generally holds a family name above the house number and street name. Line 1 holds up to twelve (12) characters. Line 3 holds up to fifteen (15) characters. Green slate with black printing. Green tree surrounded by a white oval. Please note that Line 1 character count 10 for the 2-line sign and 12 for the 3-line sign. My slate house sign worked out perfect. The engraving on the slate was sharp and clean. Just what I as looking for.